Home » Pharmacy Technician Salaries: How Much Do Pharmacy Technicians Earn? If you’ve ever walked into a large chain pharmacy such as CVS or Target and noticed a large collection of professionals buzzing about behind the counter (white coats starched and conspicuous nametags a’ shining), you probably thought, “Wow—they have a lot of pharmacists at this store.” But if you paused to take a closer look, you may have noticed that not all of the official looking folks behind the counter were pharmacists. Most establishments have one pharmacist (or pharmacist in charge) per shift, and the rest of the workers are usually assistants or, you guessed it—pharmacy technicians! The number of chain pharmacies, hospitals, and other places that dispense drugs has grown at such a rapid rate, that the demand for pharmacy technicians is higher than ever before. In fact, at 32 percent between now and 2020, employment growth in this field is among the highest in the country. Salaries for pharmacy technicians are on rise as well. To ensure quality and safety for both customers and employees, pharmacies, hospital, and other similar environments have raised standards. This means, employer requirements for pharmacy technicians are at the highest levels in history, and salaries are beginning to fall in line with these high expectations. While the average salary for pharmacy technicians is $28,400, this doesn’t mean all technicians earn this amount. Salaries vary based on a variety of factors such industry, size and type of company, geographic location, experience, and more. For example, the highest earners in the field, typically senior workers living in populous states/cities, average around $41,880. The bottom ten percent, typically entry-level workers living in smaller towns, average $20,310 per year. Although California holds the crown for the most top paying cities for pharmacy technicians, a number of other cities offer competitive salaries for technicians. Salary growth isn’t too shabby either. The average salary for just about every city has increased by 10 percent or more between 2006 and today. The following cities are some of the highest paying cities for pharmacy technicians. Based on the amount of salary and employment growth across the U.S., its safe to say that most major cities are great places to start a career as a pharmacy technician. Salary growth for pharmacy technicians is a common theme across the U.S., so although average salaries for the cities listed below are lower than the cities listed above, salaries are still on the rise. Further, “lower” salary doesn’t always equate to “low” salary. 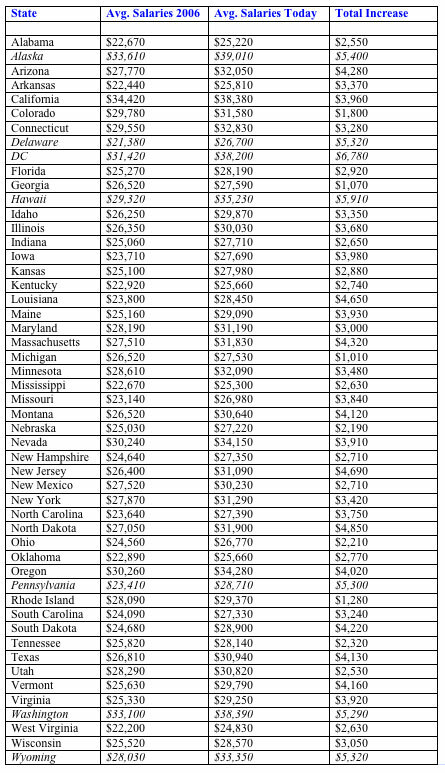 Some of the average salaries listed below are not much less than the national average of $28,400. Finally, it is important to note that because the cost of living in smaller cities is typically less than the cost of living in larger cities, so an average “lower” salary can go a long way. The U.S. is made up of 19,540 incorporated places (Census 2010). Around 273 have populations over 100,000. This means, the lists above are by no means complete. You may very well come across (what may be considered) a principal city that has a higher average salary than San Jose, CA., or a lower average salary than Charleston, WV. We just wanted to give you a good idea of how much pharmacy technicians can expect to earn in the most recognized cities, and how much salary growth can be expected from each in the coming years.